If you own beach front property or manage a marina, you know that a floating breakwater is needed to prevent storm driven waves and large boat wakes from wreaking havoc on your property. Wind, waves and sun are a major part of the dream of life on shoreline or on your boat. Then, unfortunately for some, the nightmare begins. Watch these videos of wake tests with Wavebrake and a high performance boat. The unstoppable forces of Mother Nature cause bluffs to drop into the water and wash away; storm surges to eat forty feet of land in an afternoon; break walls undermined and fall over; pilings loosened and lines snapped a tmarinas by constant stress from wave action. Until now only breakwaters, seawalls, jetties and groins were the structures used to diminish water wave energy and reduce erosion and depositions. These structures are permanent, expensive, and often unsightly and are limited in their effectiveness. The Wavebrake provides a lasting resolution to these problem. 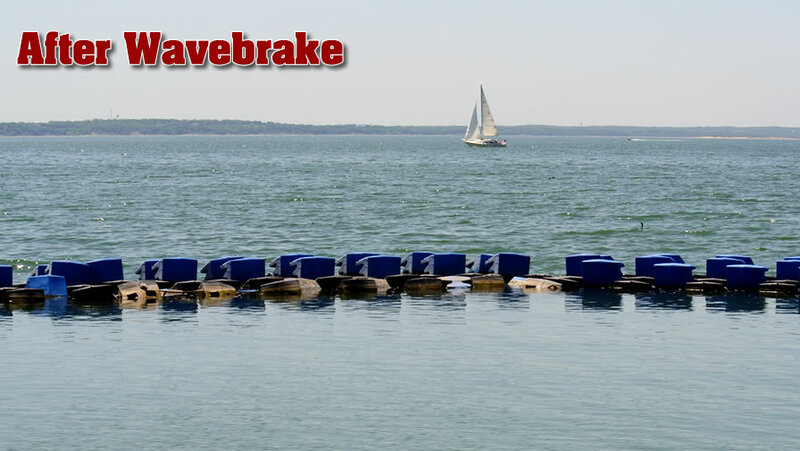 The Wavebrake floating wave attenuator system and it's application are positive attempts to bring shore lines back into balance with nature. This is accomplished through the reduction of energy in the wave there by creating an environment for protection and accretion of the shore line to occur.